We remember the launch of the Chrysler 300C very well. Mainly because it seemed to go on for about two years. It became a bit of a running joke that every few months there would be another invitation to drive the 300C, despite the fact there was still no UK launch date and no prices either. Still, we did get to see a lot of the South of France. It finally did come to the UK at the end of 2005 and was certainly a car that garnered plenty of attention. The imposing looks, dominated by that large grille which certain people decided to put a Bentley badge on (avoid those ones...) gave it plenty of road presence. But it was the price that really got noticed. It started at just £25,750 for the 3.0 CRD and came with plenty of standard equipment including leather upholstery, dual zone climate control, cruise control and a tyre pressure monitoring system. You were getting a lot of car for just £25k and for those wanting something different from the usual BMW 5 Series and Mercedes E-Class offerings, the Chrysler represented a leftfield - and cheaper - choice. Ten years on from its UK launch, prices for the 300C have dropped considerably but the value for money aspect is still true. We found this 06-plate example in the classifieds with just 65,000 miles on the clock for a smidge under £5k. The one caveat is that it's the 3.5-litre petrol which although very smooth and effortless, is not exactly economical. On the plus side, the V6 engine has a lovely sound - which will be enhanced by the Startech exhaust system - and it has plenty of power on tap with 250PS. That said, it's not that fast. You'll also be lucky to see more than 25mpg on average from the petrol and be aware that your annual road tax will be a hefty £505, so running costs aren't going to be cheap. If you want a 300C for big mileages go for the CRD diesel, although for less than £5k you'll be looking at cars with more than 100,000 miles. What this 300C does have in its favour is its low mileage. It looks like it has been cared for with a tidy and clean interior. It also has plenty of extras including heated seats, navigation (which was never the best system but worked reasonably well), xenon headlights and a seven-speaker Boston sound system. It also comes in metallic black, the best paint colour for the saloon in our opinion. Although if you go for a black Touring it can end up looking like a hearse. The saloon is pretty practical too and the rear seats fold down to you can carry bigger stuff if need be. We're not so keen in the Startech alloys. 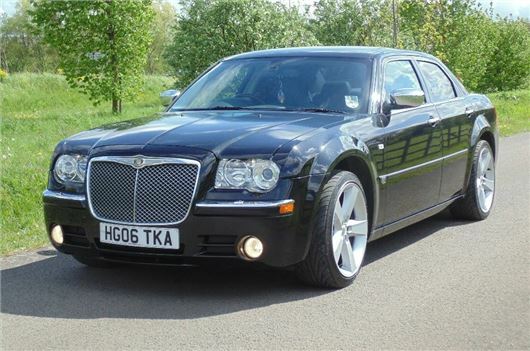 The Startech extras were official Chrysler dealer extras, but we'd prefer the standard 300C alloy wheels. They may not look as sporty but they provide a better ride and you're less likely to kerb them. The reason the ride quality of the 300C was so good was that it used a combination of Mercedes S-Class and E-Class suspension. We agree that it's not everyone's cup of tea, but the 300C is a distinctive saloon that has plenty about it to make it stand out from your usual big executive cars. And for £5k you'll be getting far more car for your money than an equivalent 5 Series or E-Class. I've owned my 300crd estate from new 2010 covering just 12700mls. The car rides very well on flat roads & irons away any bumps, potholes etc. It can feel a little floaty when pushing it a bit on undulating roads & the steering can be short of feel on hard cornering which can be disconcerting. It is no racing sports car but just a great tourer & as long as you treat it as such you'll be OK. That doesn't mean that you can't have fun because you can. I had mine re-mapped & now it is just shy of 300bhp & 0-60mph just under 6set's. When buying a used saloon or estate they're basically the same except for the obvious check that it has had the Chrysler dvla re-calls done,you can check at dvla website. There are 3 recalls upto 2017 that I have been notified, a new ignition switch with keys replacement, bolt replacement on passenger & driver's front airbags, apparently they have been known to explode when exposed to damp/humidity so imperative you have it done especially in our UK climate. They are carried out at your Chrysler dealer free of charge &should have been done but some may have slipped through. The car can be cheap to run for the type of car it is if you use a good works. Chrysler dealers are a bit steep & a lot of dealers didn't last long so not that experienced the few that became Jeep. A genuine rear wiper blade is approximately £20+v.a.t. & not kept in stock. Even service items the local dealer wanted to order only taking at least a couple of weeks! A service kit can be got hold of easy enough through motor factors, eBay etc & it's important you use the Mercedes graded oils. The k&n airfilter gives good performance for little money compared to the paper filter but just changing this means you have to tell your insurance company but having said that I found that even with all the mods I've done the insurance is cheaper by £600! by using a well known sports car /modified car insurance company under £400 fully comprehensive. Things to look out for is failing alternator, mainly burnt out thanks to diesel fuel dripping constantly from 2 small rubber hoses that cracking & leak. A new alternator, I had a Lucas unit @£165.00+v.a.t exchange. The hoses only come from Chrysler as a pack,2 rubber hoses, 4 fuel line clips & 2 metal fuel pipes which are approximately 8" long ea & costs just short of £100 with vat & again 2 weeks ordering time but when pushed for off the road 4 days no trade discount. These hoses are now available from the Chrysler Store an independent company for approximately £25 plus many other parts & mods. The thick cable that earth's the alternator can also be prone to rust which leaves the car unable to fire.Chrysler only or make one approx £100. Need to change a repeater bulb means pulling the plastic splash guard away partially but be careful how many of the plastic rivets you remove as they are over £10each! & have to be ordered. It seems that any clip door trim whatever costs a bomb minimum of £5.00. Suspension linkages need inspection especially on high mileage as tendency to wear but are easy to replace at a reasonable price, eBay prices about £200 for complete front set Inc top & bottom wishbones, track control arms,ballpoint etc or individually. There are now silicon replacement bushes at the Chrysler Store. Rear bearings have to be replaced on poorly looked after cars but are adjustable to a point. Replacement brake discs and pads start from as little as £80 axle set but obviously more for the better quality. Rear about the same but handbrake shoes about £35 & handbrake shoe fitting kit about £25. Everything else is more or less standard service needs of any car, there have been issues with the swirl motor /flaps but mostly it's oil leaking into the turbo but that can be cured before or if problem with the modified seal kit from the Chrysler Store. Trim parts need careful examination as stupid prices to replace from Chrysler. Check the leather seat slab for any signs of cracking or splits pushing down on the seat Base to expose hidden splits. If you find any especially on drivers seat Base negotiate a bit off the asking price as a genuine Chrysler replacement just for the seat NOT including the back rest is close to £700 + v.a.t!!!!! So either find a replacement used or a good trimmer. Overall the car is brilliant don't be put off by some of the issues as they're mostly on poorly looked after vehicles. I'd prefer the diesel over the petrol unless it's the hemi, it's reasonably economical 24-5mpg local & achieves Chrysler figures on a run of just under 40mpg. Insurance group is higher than a jag xf by about 5 but check around the like of Adrian Flux etc. Obviously buy the best you can afford &don't buy a boy racer that's been dropped etc unless that's what you like but get it checked properly to make sure it's not jack built. Other than that I'm a keen fan of the Chrysler, ignore what top gear said that was about the early model & also Mr Clarkson said you couldn't alter the brightness of the instrument panel,well if he'd looked to the right he'd have seen the switch! The sound system is a 8 speakers system standard with a cd/dvd player, a hard-drive with sat nav was option at £2500.00. The dvd player can be converted to TV with the mod kit approx £250. All in all a great car & bargain. Boris the Spider.